The takeaway was allowed to remain open last year on appeal. A takeaway which hit the national headlines after a video of late-night partying surfaced has been stripped of its licence to open after 11pm. 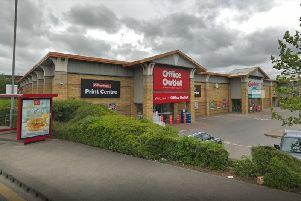 Shalamar on Westgate fell foul of the police after a 2015 YouTube clip showed revellers dancing to loud music inside the premises, despite the takeaway having no legal permission to play music. Now the business has been punished again after it failed to employ door staff, operate working CCTV and keep an incident logbook up-to-date. Shalamar had originally lost its licence last year after the police raised concerns about how it was being run, but it was allowed to remain open after an appeal on condition those measures were implemented. But licensing officers found the takeaway was not complying with any of these rules when they visited on multiple occasions between last November and February this year. They also found two loud speakers beneath the counter, which staff said were only used when they were tidying up after closing time. But Shalamar's manager Hukam Rasool blamed his older brother, who he said had hands-on responsibility, for the problems. Speaking at a licensing hearing on Thursday, Mr Rasool said: "It's a family business and my brother is much older than me. "I kept saying to him, "Look we need to do these things", but he wouldn't listen to me. He wanted to do it his way. "My brother didn't want me at the place at the time. Whenever I asked him about these things, he'd say, "Oh, I'll do it next week." "I know it's down to me. It's my fault." Mr Rasool said that he had now taken over the day-to-day running of Shalamar, and added his brother would no longer be there. He said door staff were now employed to work outside the premises and that the CCTV equipment, which he said had been broken for "two to three months" was now working. But the council's licensing panel took a dim view of the offences, and said they had no confidence in Mr Rasool's ability to run Shalamar responsibly. Licensing officer Paul Dean said Mr Rasool had "blatantly ignored" council and police warnings about the conditions. He told the panel that the takeaway's incident book was blank despite the authorities' knowledge that a man had been punched in an attack at the premises a month previously. Councillor Martyn Johnson told Mr Rasool: "You've just passed this premises onto your brother and left him to run it. "Your name is on the licence so it's your responsibility. "You have door staff for a reason, you have CCTV for a reason. Things happen in a city centre late at night. "I can't believe that if your cookers were broken you wouldn't get them fixed instantly, so why wouldn't you get your CCTV fixed? "I think your brother's put you in a very difficult position."